eco-friendly crafts | She's Crafty! I’d like to give a shout out to a cool website that is currently featuring my recycled map stationery in their holiday gift guide: Green Upgrader! I am really psyched to be included in the group of eco-friendly gift ideas that they’ve assembled. This is a super cool site, and handmade (especially eco-friendly) gifts are the “in” thing this year. And hopefully every year! 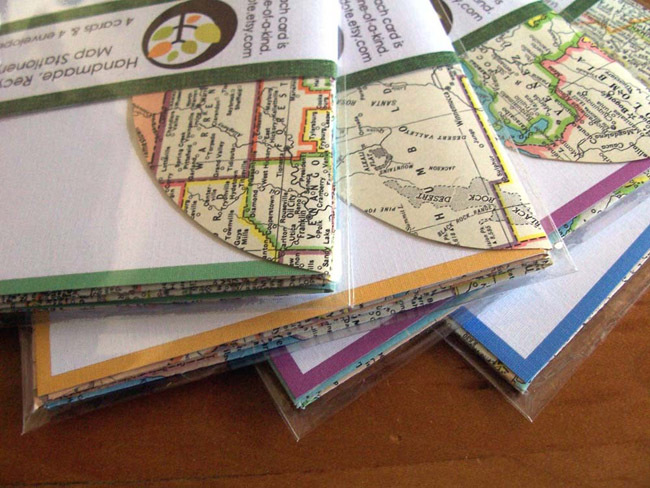 My recycled map stationery can be purchased here! It’s really very affordable, and you can feel good about buying a product that supports sustainability and an independent artisan. Perfect for your favorite traveller or eco-minded pal. My handmade stationery sets made from vintage Appalachian Trail maps were featured on a blog this week! Thanks to another Megan at Studio M.M.E. Stutterings for taking notice of my handiwork. Check out my Etsy shop (Dote Handmade Goods) for the entire selection.